Baby soft skin doesn’t just happen overnight. After an evening shower spiked with a serving of Khus + Khus Kama Body Polish, I’ve seen that it actually can happen. A mix of salts and oils, Khus + Khus’ Kama Body Polish exfoliates the skin while moisturizing it with jojoba, coconut and babassu seed oils. 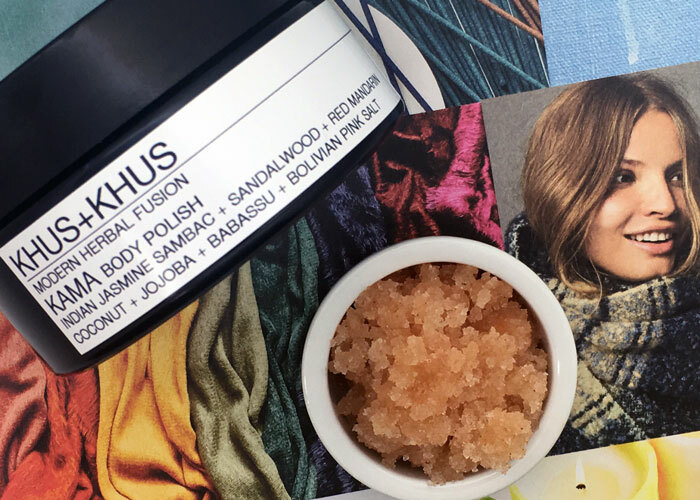 Compared to other scrubs, Khus + Khus has a lighter, airy texture, similar to that of a snow cone, because it is absent of clays or butters. A post-shower moisturizer (think body oil, lotion, cream or butter) is totally optional, as this scrub contains just enough carrier oils to coat your skin in moisture without making it feel sticky or tacky. If your skin is extremely dry and itchy, you might want a slight, additional layer of moisture after using it, but for me, it was just enough to keep my skin feeling soft. Texture aside, what I really want to talk about is scent. Jasmine lovers, wow, you will definitely want to try this one. The blend of jasmine, Siam benzoin, sandalwood and mandarin give this scrub a heady, well-perfumed fragrance cut with citrus and wood, resulting in a light, feminine floral that layers well with other scents. My only real reservation with this body polish is its price. Plainly spoken, it’s expensive at $66 for a 200mL Miron glass jar. For someone who is heavy-handed and indulgent with body scrubs (and most other shower products), it won’t last long unless you are very mindful of how much you use. But with how amazing it smells, it will be difficult to resist. What body scrubs do you use and love? Do shower and bath products packaged in glass concern you? What’s too much to pay for a wash-off shower product? Tell me in the comments!